Flygande Jakob (flying Jakob) is a modern Swedish classic, invented in the 70s by an airline freight man called Arne. 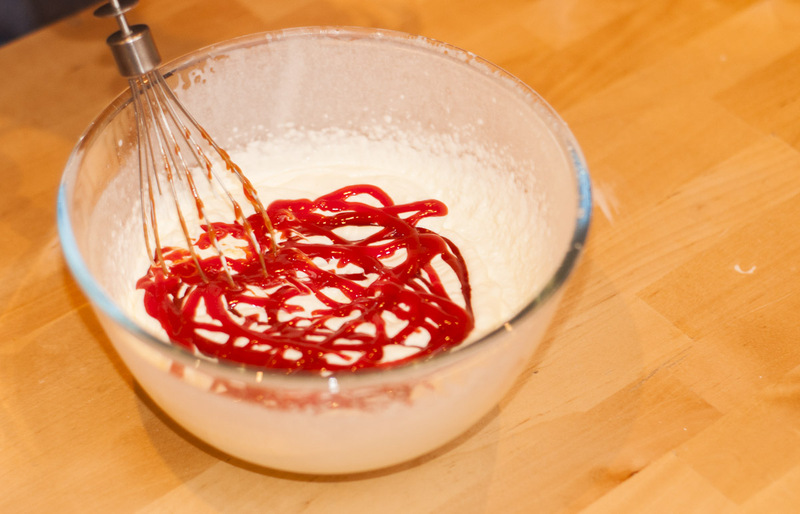 I love its savoury weirdness, as it mixes whipped cream, ketchup, curry and banana. The original includes chicken and bacon, but I enjoy this one with quorn. In trying to become a half-veggie, recipes such as these are a good way of substituting chicken, telling no substantial difference whatsoever. I tend to be skeptical of meat imitations, because vegetarian food holds it own very well without copying meat, and also because imitations rarely taste as good as the real thing. But this tastes marvellous, and I over-binge every time we make this at home. Start by frying the quorn pieces in a little bit of the curry powder and oil. Once they’ve taken on some colour, let them cool while you whip the cream. Mix the ketchup into the the cream, and add the rest of the curry powder. 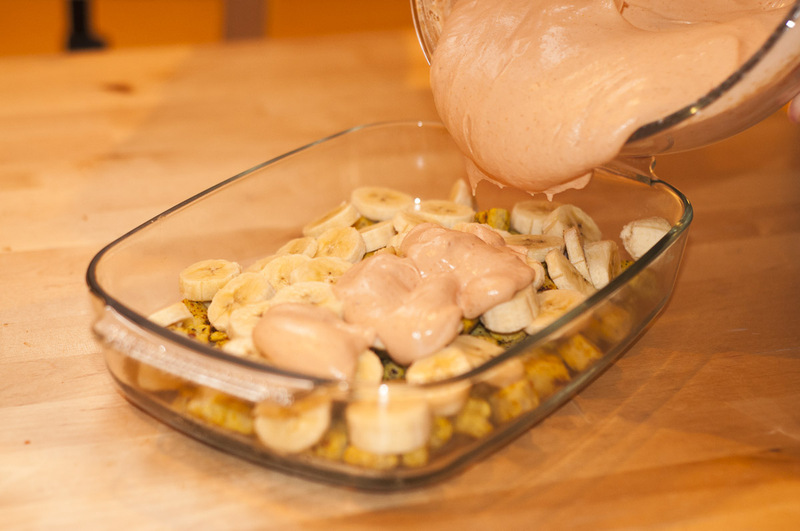 Cut the banana up in fat, coin-sized pieces, and scatter it with the quorn in an oven-proof pan. Distribute the whipped cream evenly on top, and let it sit in the oven at 200 degrees for about 20 minutes, or until it has browned on top. About five minutes before you think it’s ready, scatter the nuts on top, and put it back into the oven. Take it out and let cool slightly while you prepare a cold beer and set the table. Serve it with basmati rice, and some sriracha chili sauce on top for those who want to some heat with the savoury sweetness. Needless to say, this really does taste better the day after, and makes for a perfect lunchbox. We’ve tried making it healthier by substituting cream with Turkish yoghurt, but I would not recommend it. This is my great grandmother Rut’s recipe, and perhaps my favourite recipe of all time. My grandmother, who would make this on Sundays, was born in a small unpronounceable village called Djurröd in Skåne. Only 84 people live in Djurröd. The centre of Djurröd looks like this, and perhaps the desolate nature of Djurröd explains why my family still eats chicken with plums and apples when other Swedes save it for medieval themed-feasts. But who cares – the sauce accompanying this chicken is superbly savoury, creamy and sweet, and the cucumber pickle goes beautifully with it. Start by cleaning and preparing the chicken. Untangle the wings if they’ve been tucked into the back, cut off unnecessary fatty bits (by the neck and back), and remove any leftovers of feathers. 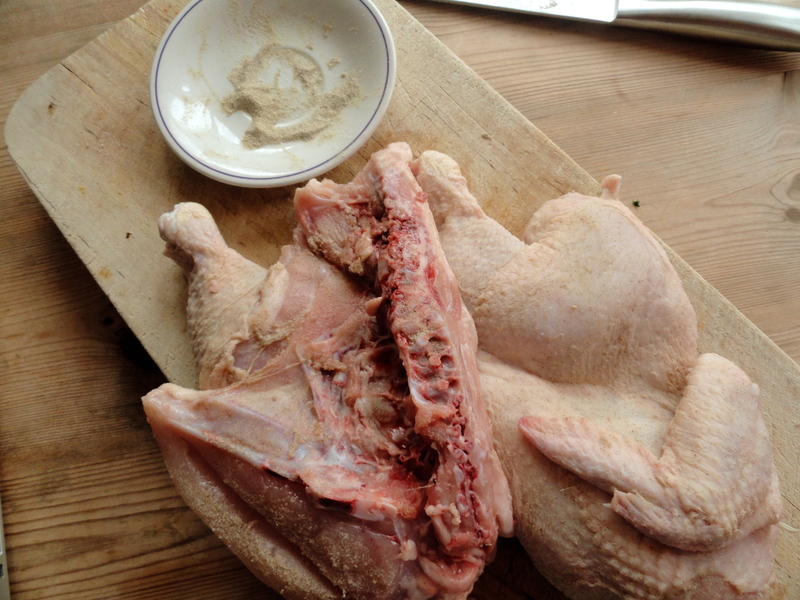 Cut the chicken in half through the filets with a sharp knife, and rub it all over with the salt and white pepper. 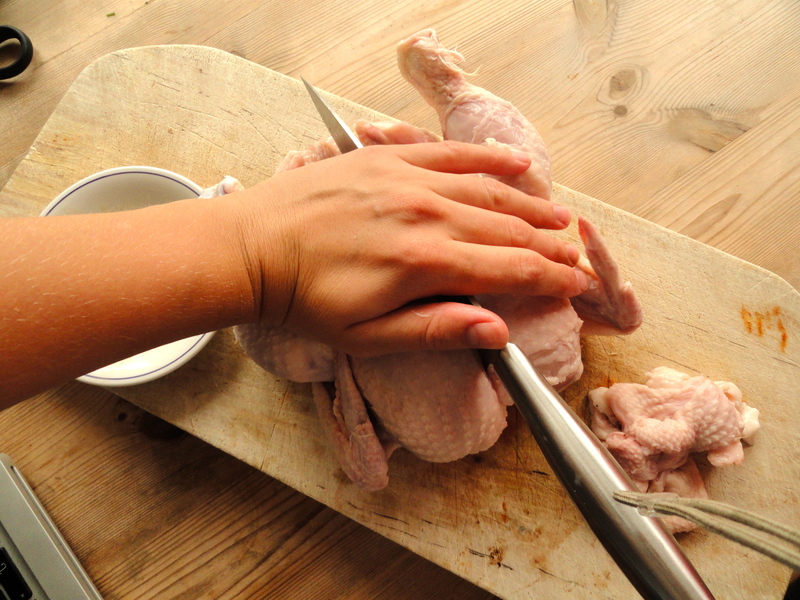 It’s handy to keep it in a mix on the table as you prepare the chicken. When you’re done preparing the chicken, melt the butter and some tablespoons of oil in an oven-safe pan on the stove (it’s good if it has a lid, and can be put into to over, but you can also start in a frying pan and move the chicken to an over-proof form later). Add the chicken to the pan, and let it fry gently for about five minutes on each side. Brush it with chinese soy whilst it’s frying. 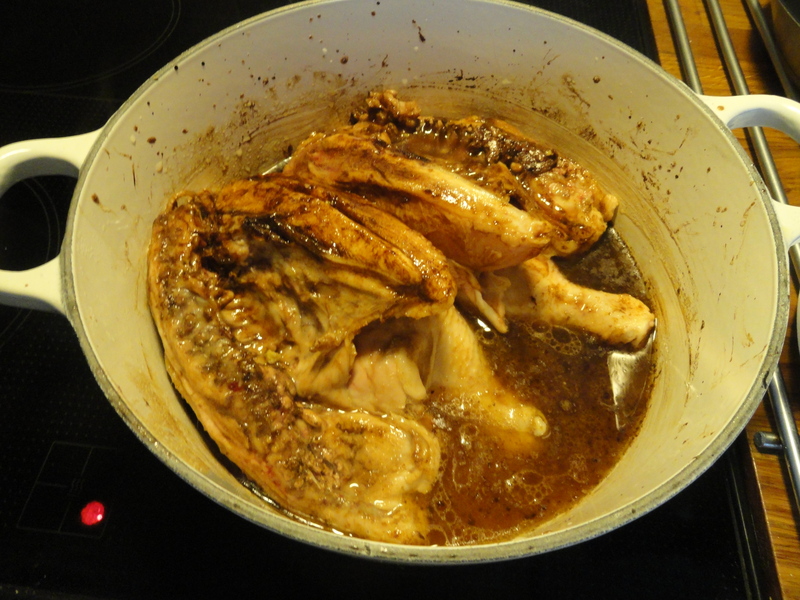 Then add three decilitres of water, one cube of chicken stock, and put it into the oven on 200 degrees. In the meantime, peel the potatoes and let them rest in cold water. 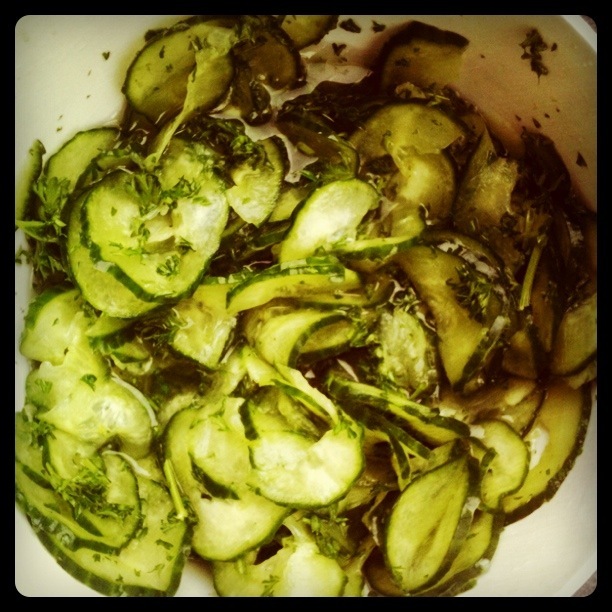 Start making the cucumber salad (recipe further below). After about 30 minutes, take out the pan, prick the chicken and pour the juices from the pan all over it (make sure the filets face upwards). 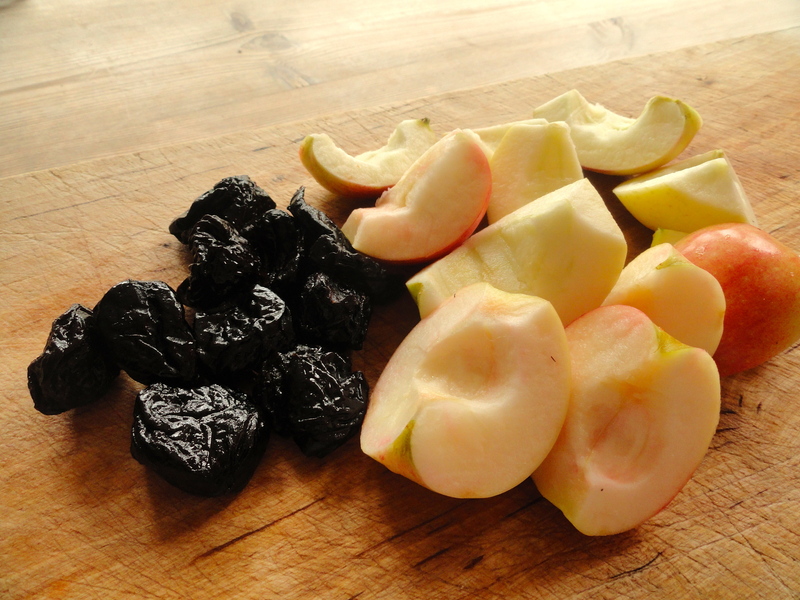 Add the prunes and apples to the pan, and put it back into the oven. 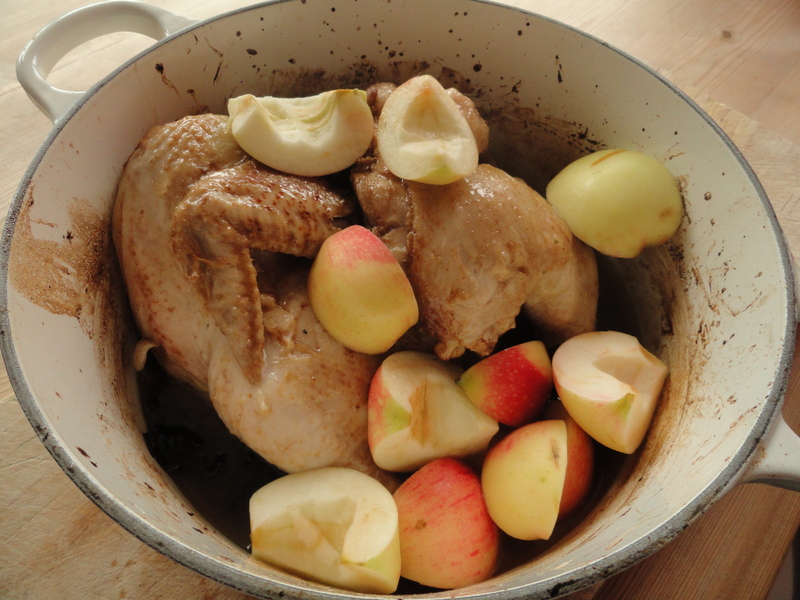 Try to push the apples and prunes towards the bottom of the pan, or below the chicken. After another 15 minutes, take it out again to again douse it in juice. Put the pan back into the oven, this time without the lid on. After about another ten minutes, the chicken should be done and ready to take out. Watch the chicken carefully if it’s smaller, as the cooking time may range from 40 minutes to over one hour depending on size. 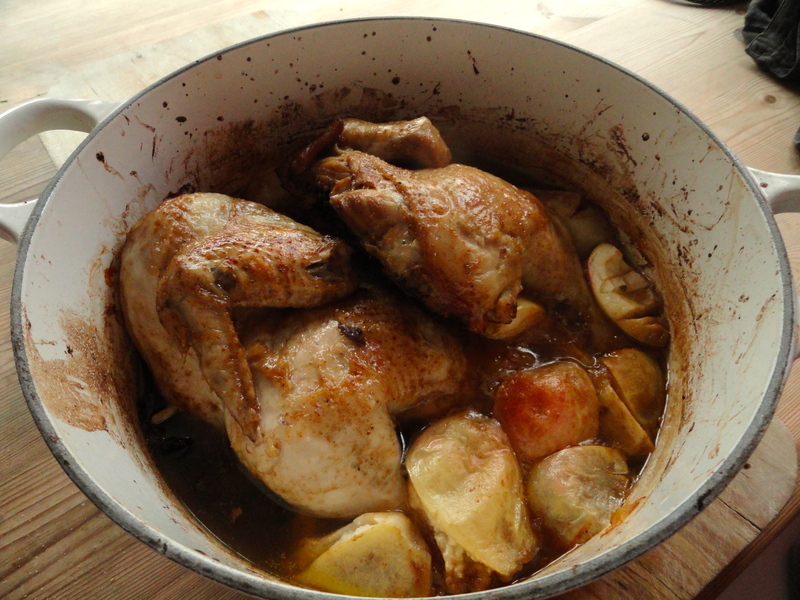 Remove the chicken from the pan, leaving the juices inside. Let the chicken rest by the side as your prepare the sauce, keeping it somewhere where it keeps its heat. Also remove the potatoes and the prunes and put somewhere else ( they’re not pretty, but you can serve them as condiments to the chicken later on). Sift the leftover juices if you prefer the sauce thin (I never minded random bits of chicken in it), and then carefully scoop out excess fat with a slotted spoon, holding the pan at an angle. 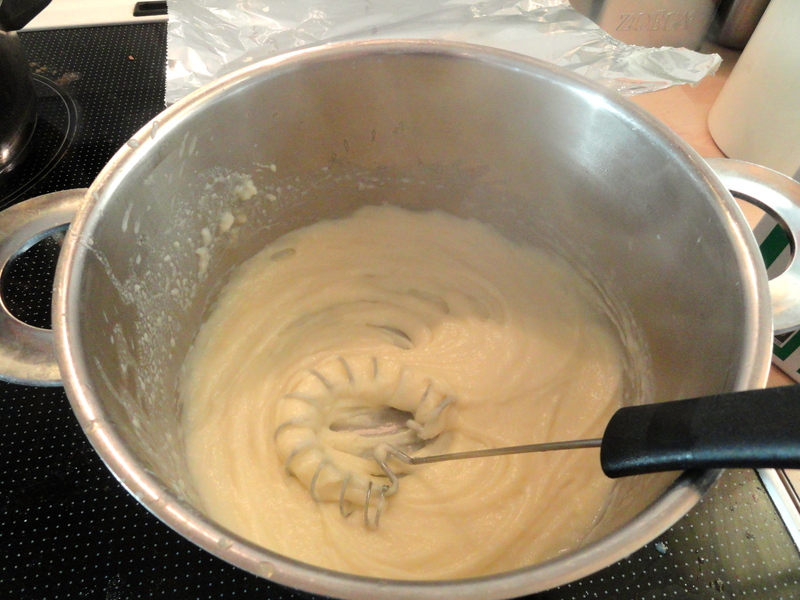 Mix in some flour with a whisk, as well as sugar, and let it come to the boil and thicken. Then add two deciliters cream (or to taste, depends on how strong you want the sauce), and spice is more with salt, white pepper and soy according to taste. Remember that the sauce should be a little bit to strong in flavour on the tongue on its own, as it needs to liven up both the chicken and the potatoes. Serve the newly boiled potatoes with the pickled cucumber, chicken pieces and sauce right away. 1 tablespoon ättika. Ättika is a form of Swedish vinegar, you’ll be able to get it at any Nordic shop. I haven’t tried making pressgurka with other kinds of vinegar, but perhaps that would work too. The proportions would have to be different, though: ättika is 24% acetic acid, and is therefore very strong and inedible to use just as it is; malt vinegar is typically 3% acetic acid, balsamic vinegar about 6%. A small bunch curled leaf parsley (flat leaf is also fine, as the taste different isn’t huge: however the curled leaf smells more like fennel and dill to me, which is closer to the Nordic cooking tradition). Making pressgurka is very easy. Slice the cucumber with a cheese-slicer, and squeeze it gently with your hands for about one minute. 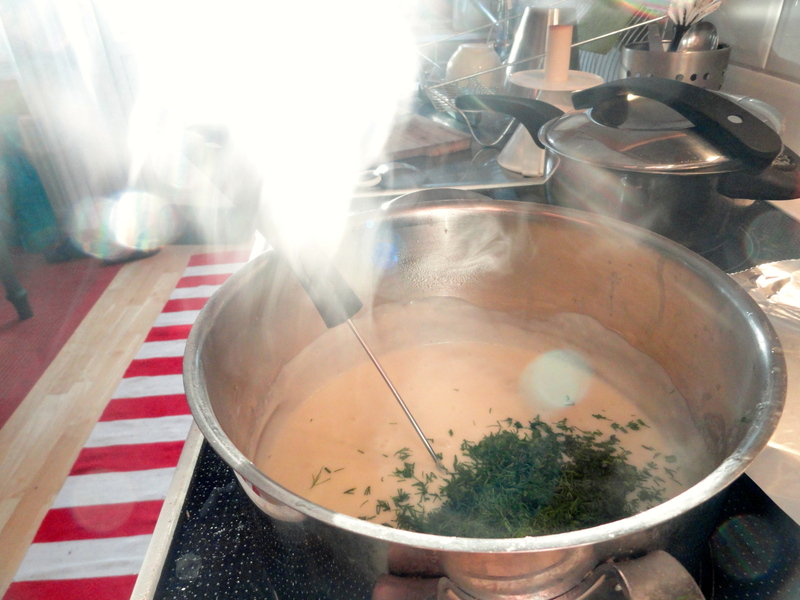 Mix together the ättika, water, salt, white pepper, and parsley, and put in the fridge for at least one hour. Serve alongside the chicken. This is a rather short post, just a little shout-out to the best herring sandwich I ever had (I wrote about this Swedish delicacy and how to make it at home a while back). 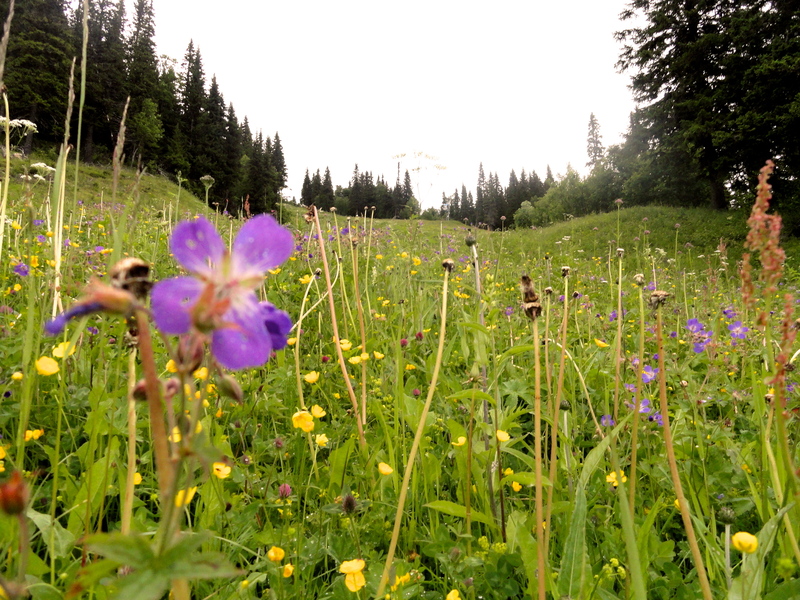 Two weeks ago I had the pleasure of attending my cousin’s wedding in the Swedish mountains, at Hotel Fjällgården in Åre, close to the border of Norway. The scenery is, as might be expected, breathtaking, but being an utter food-pig this sandwich was the star of my weekend. (Apart from the beautiful bride, of course). This sandwich was more voluptuous than a normal matjessillmacka, as it was much bigger and, frankly a bit excessive. It had all the key building blocs: delicious matjes herring (the best kind, in my humble opinion), Swedish soured cream (gräddfil), red onion, chives, potato, warm sweet dark bread and boiled eggs. In addition, it was sprinkled with small bits of beetroot and capers, which sharpened the salty-sweet scale. But the magic ingredient was clarified butter, which was doused (very generously) on top and gave it a sweet, even caramelised flavour. Hardly healthy, of course, but ridiculously delicious. Not that one passes by Åre every other day, but if you do, make sure to take a trip up the ski slope to Fjällgården, for this sandwich is absolutely worth the hike. Unfortunately, Sweden isn’t really a cheese country. Moving to the UK altered my relationship with Swedish cheese for good, as I realised that even the English do it much, much better than us. Rather predictably, this alienation has only increased since I moved to cheese-loving Belgium. 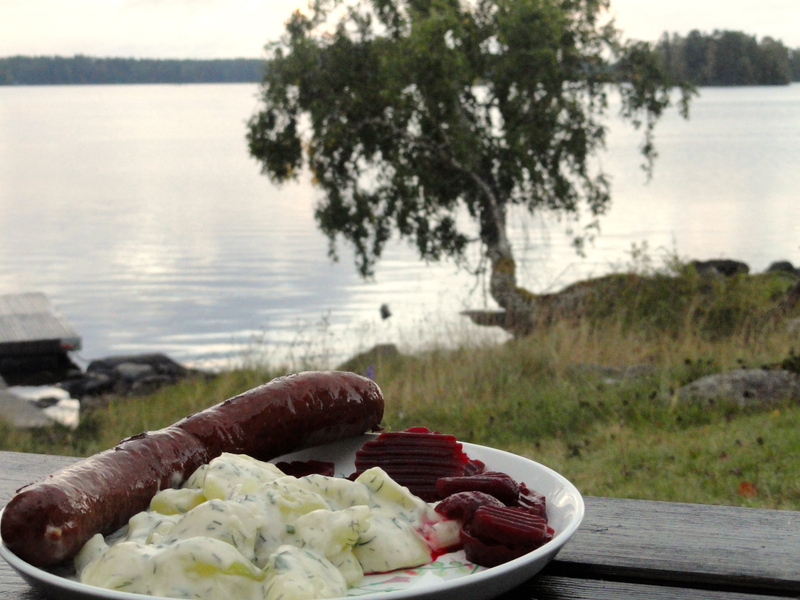 However, there is one exception to the Swedish cheese rule: Västerbottensost. It’s about the only internationally famous Swedish cheese aside from mesost (a sweet, caramel-tasting soft cheese from the north. I refrain from comment). Västerbottensost is skinny for a cheese, and quite salty. Friends who ate it this weekend likened it to parmesan, but nuttier. 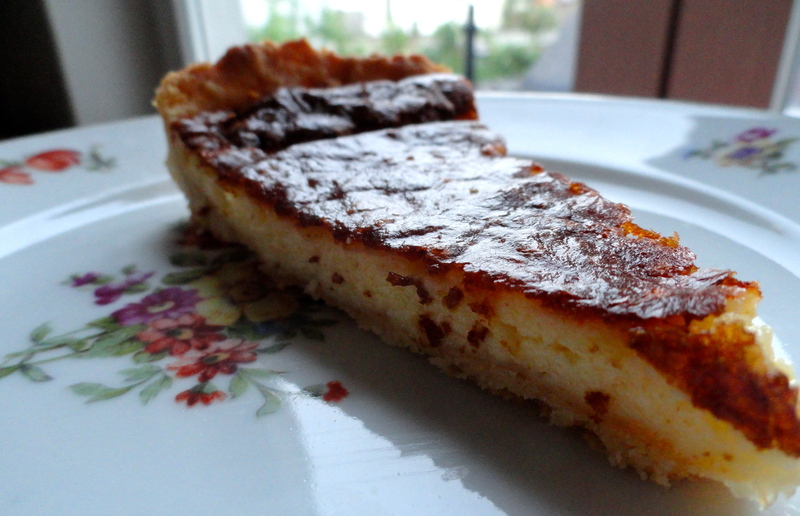 And it melts and browns beautifully in a very rich quiche (Västerbottenpaj). I was lucky to have two Swedish friends visiting this weekend to help out making one. 300 grams Västerbottensost (one piece is normally about 400 g). It’s an expensive cheese, as supply is limited. Needless to say, they don’t stock it in IKEA, but you should be able to find it in any Nordic food shop. Start by chopping the butter, mixing it in with the flour. Once a dough is formed, add two tablespoons of cold water and form to a ball. Put the ball in the middle of round cake-tin, and push it out towards the corners until it covers the entire tin. Prick it all over with a fork, and pre-cook it in the oven for 10 minutes at 200 degrees. Patricia and Sandy cooking Västerbottenpaj. 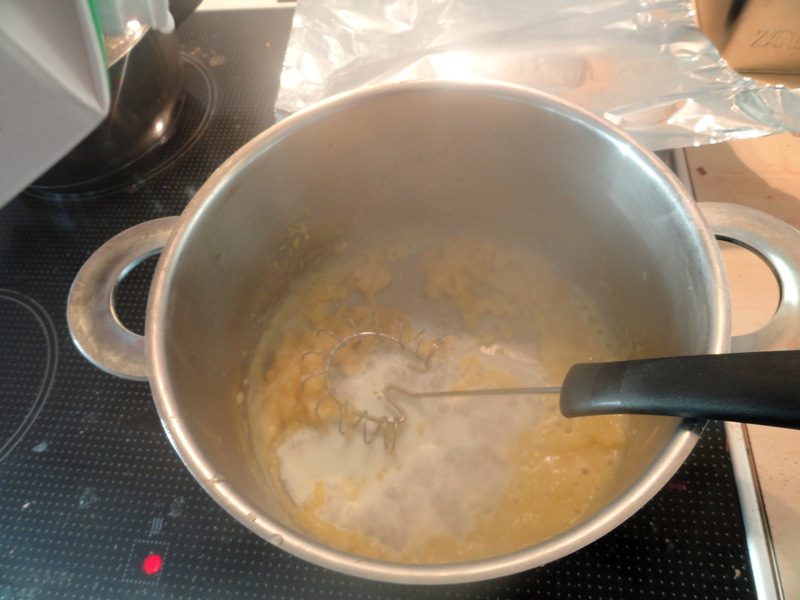 Grate all the cheese and mix it with the eggs, cream and salt, together with some black pepper. 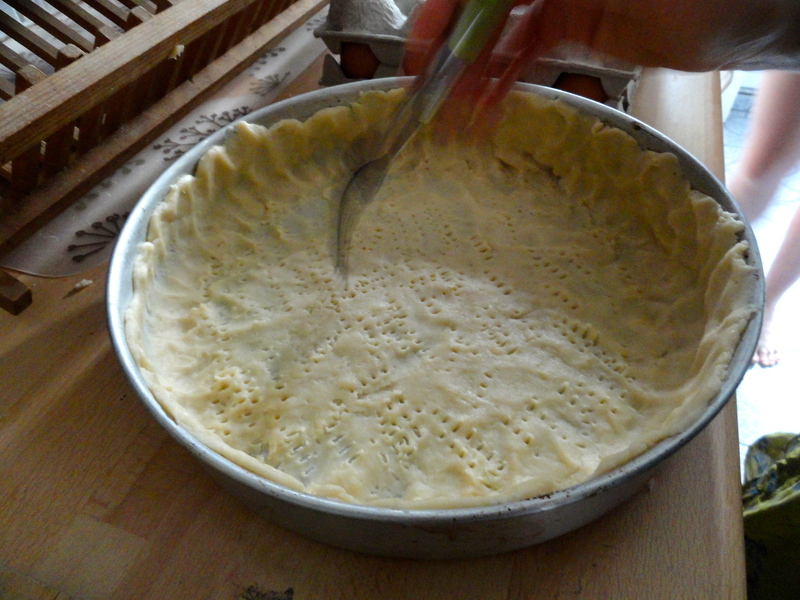 Once the quiche base has been in the over for 10 minutes, take it out, and carefully pour the cheese mix into it. Put it back into the oven for another 30 minutes (keep a close eye on the it, but don’t panic it if the cheese goes a bit brown: it’s meant to look rather dark when it’s done). 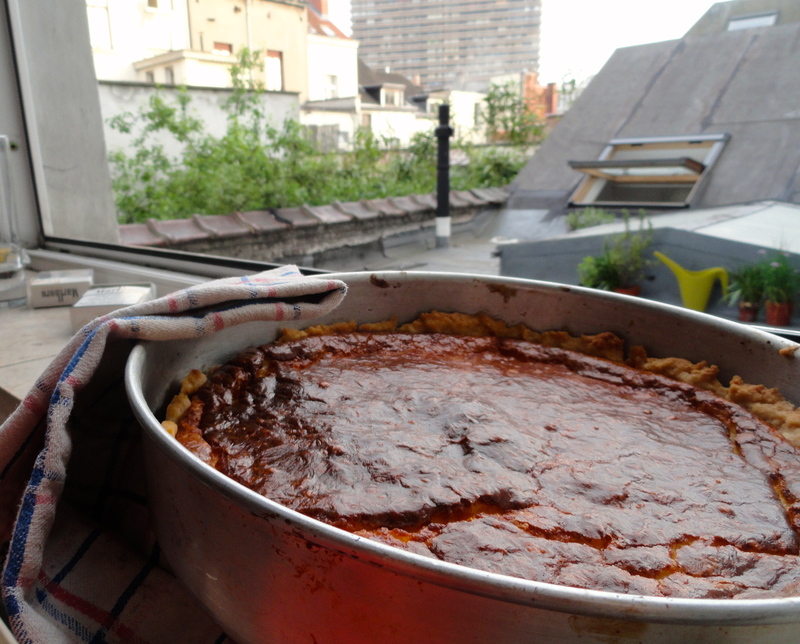 Let cool for a while before you serve it, because it’s best served lukewarm (or lagom warm for this sort of quiche – lukewarm sounds a bit meh). It’s very rich, so it is best accompanied by some other dishes too. Enjoy! Working full-time leaves far too little time left over to cook. In my utopia we’d all be working three hours a day, followed by two hours food shopping at a cheaper version of Borough market, before cooking all afternoon and eating all evening. But before that’s been turned into a workable economic model, we have to make do with simpler things, like Swedish rösti with caviar. Quite a light supper, it’s a perfect snack before going out (don’t worry, that kebab in the wee hours of the morning will keep you from starving). 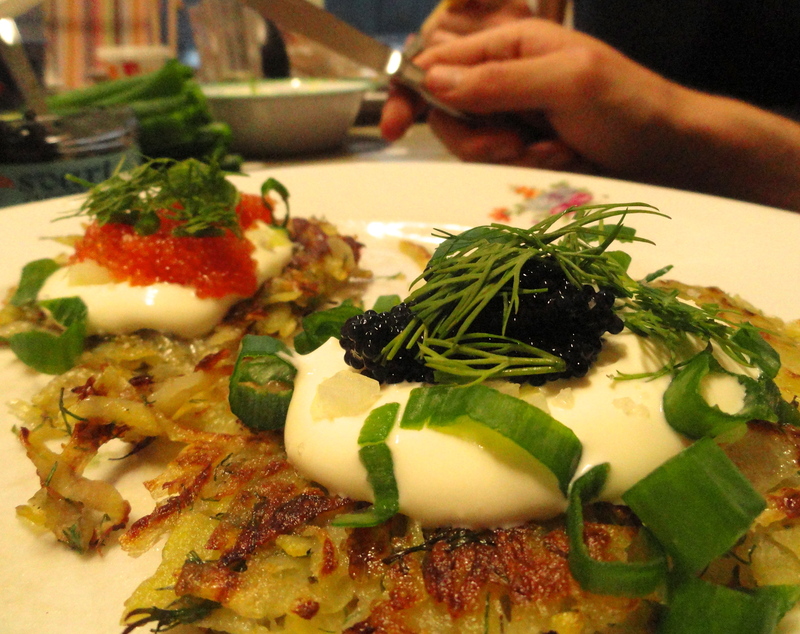 Making rösti is very easy, and you can take it quite far from its humble origins if you top it with fresh Swedish ingredients like gräddfil (sour cream), dill, spring onion and caviar. 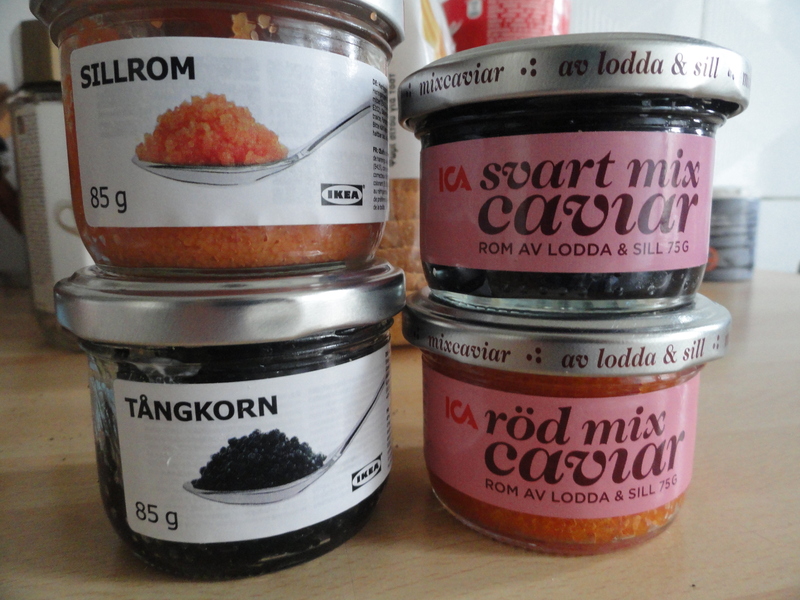 What with IKEA’s food empire being spread all over the world, you can buy Swedish caviar very cheaply. This isn’t fancy caviar in any sense (it comes from the herring), but it’s still salty and delicious. A selection of caviar glasses – theses are about €1.50 in IKEA. They only have red, black and vegan caviar, so if you want nicer stuff find a Swedish shop where they will have Stenbitsrom or Kalixlöjrom. Start by chopping and frying half of the onion on a low heat. Peel and grate the potatoes, and mix in the onion. 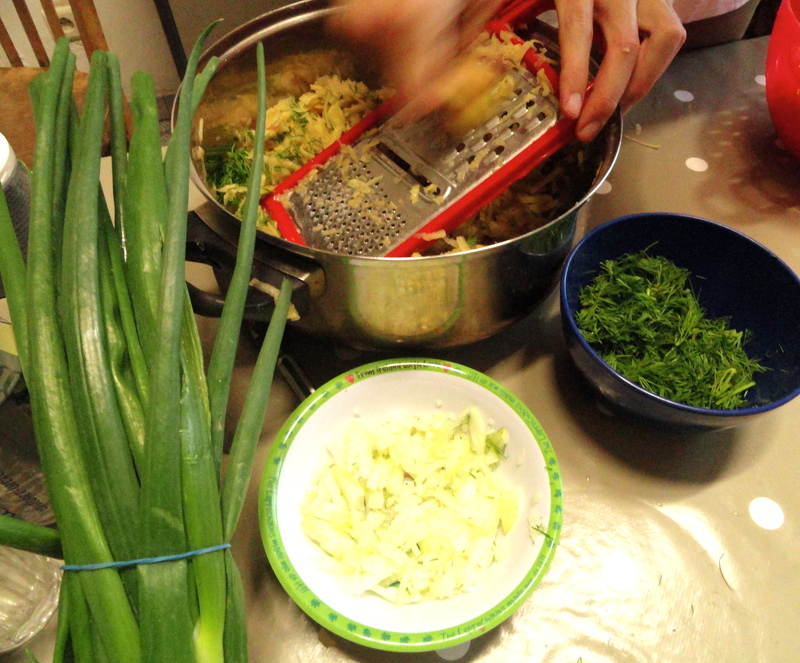 Also add half of the dill, the egg and salt to taste. Form the mix into flat rounds, about half a centimeter thick, and carefully place in a non-stick pan, on a medium heat with plenty of oil and butter (a mix makes for the best flavour – it’s not meant to be a health meal). Flatten the cakes with a spatula once they are in the pan, as that makes them stick together better. Let them fry about 4 minutes on each side, until they are golden. Carefully lift them out of the pan onto kitchen roll, and keep frying these until you’ve used up all of the mix. An easy way of eating them is to just place all the condiments on the table and let everyone make their own caviar creation. However, if you want it a bit nicer, place two rösti on each plate, add some of the chopped onion, a generous dollop of creme fraiche, the caviar of your choice, and top with chives, dill and spring onion. Serve with cold, light beer, and vodka if you are going out. I’m currently hiding away in a little cottage in the vast forests of Småland, after six consecutive nights of heavy Swedish Christmas dinners. The next few days I intend to eat only pizza and salad, and possibly a curry if I can be bothered making one. But it’s Christmas, so most likely I won’t. Since I’ve had the pleasure of being served food by everyone I’ve visited this Christmas, I will not present any recipes in this post, but rather a little run through of what Swedes eat at Christmas, and why it’s amazing despite its gluttonous repetitiveness (at Christmas, we tend to eat a variation of this for all too many nights). The basis of Swedish Christmas food is our love for sandwiches – its basically sandwich food, just a bit over the top, and without much bread. Southern Christmas food (Skånskt julbord) tends to be the most over-the-top of them all, in line with the Southern tradition of exaggerating and bragging through food. You must start with the fish dishes (it’s always a buffet, all you can eat-style), and here the herring takes up most of the space. It’s normally eaten with eggs, caviar, boiled potato and dark bread. 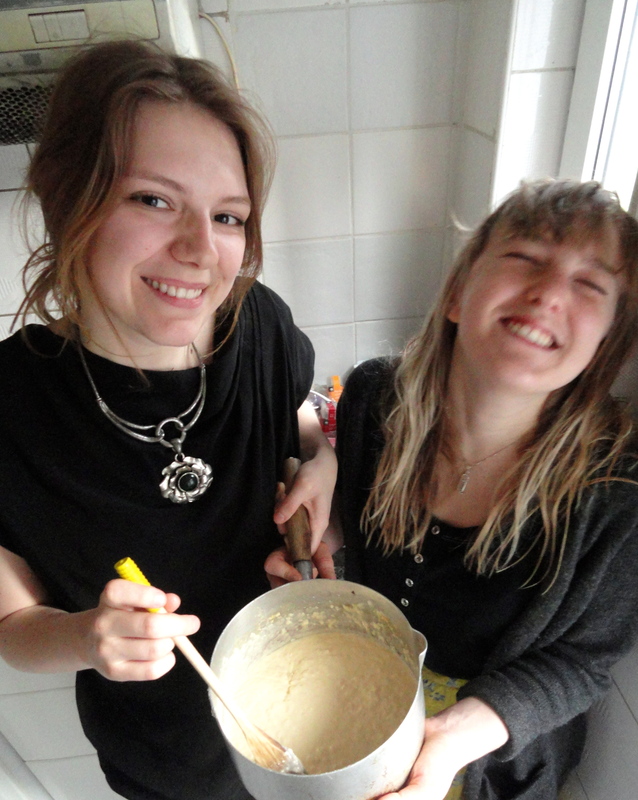 You will have several versions of home-made pickled herring (inlagd sill) and the guests are normally expected to contribute with a few kinds of their own. One of the tables I visited this year had ten different varieties, including the classics with mustard and onion. My undisputed favourite remains my stepdad’s curry herring with apple. It sounds weird, but it’s amazing. The second staple of the fish table is gravlax. Ambitious people make this by themselves, by rubbing a salmon in sugar, salt, dill and pepper, and leaving it to ferment lightly under something very heavy in the fridge for a couple of days. The method of making gravlax actually stems back to VIking age, when people used to bury fish deep into in the salty banks of beaches, as a way of preserving it until they wanted to eat it. 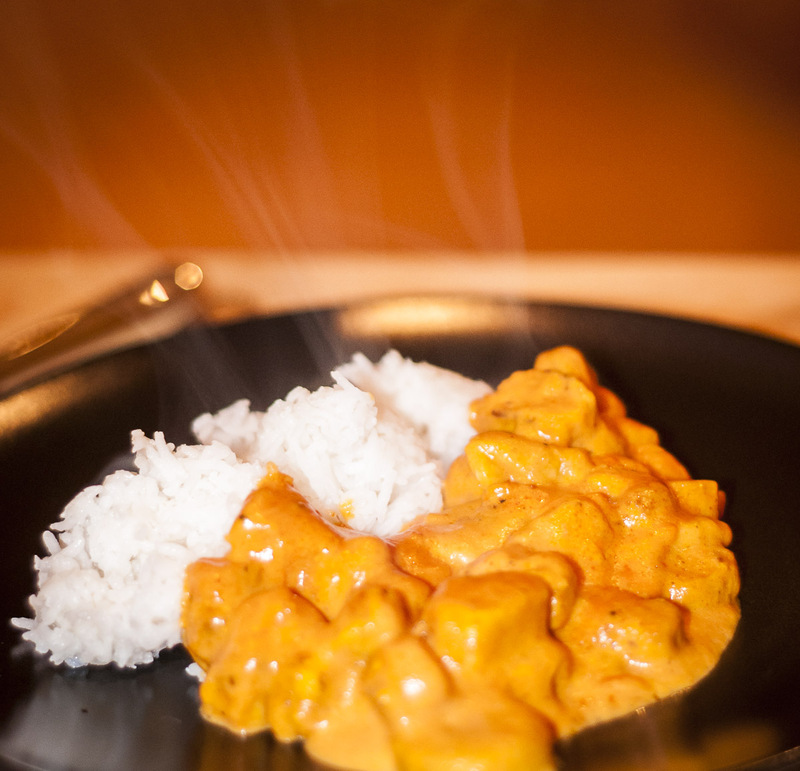 It tastes somewhat similar to smoked salmon, but with stronger hints of spices. 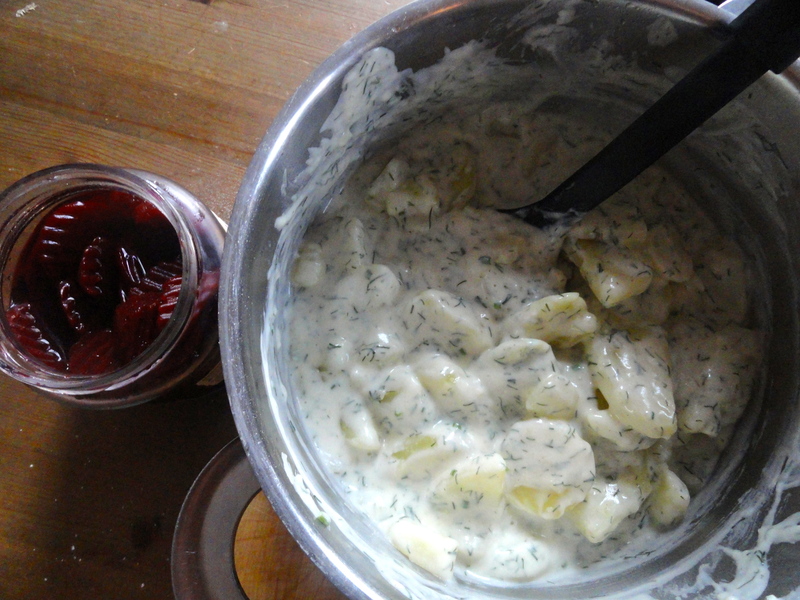 The sauce that goes to it (gravlaxsås) is sweet, tart and full of dill. However, the real star of the fish table is the smoked eel (rökt ål). It’s normally served with scrambled eggs, and its delicate smoky creaminess is simply sublime when done well. The conscious reader will know that due to over-fishing, fishing Baltic eel becomes illegal every now and then. However, stubborn traditionalists will still sneak it up on the table for Christmas with a sly smile to the general applause of other traditionalists. I’m not too bothered with tradition, but eel is one of my favourite kinds of food ever… and my aunt promised me that this year’s eel came legally, from a nearby lake. Now, moving on to the meat table, the meatballs (köttbullar) are obviously a key feature, served with beetroot salad. The meatballs are so central that in some families, you will have several different batches of meatballs. One year my mother, gran, aunt and cousins had all set about making meatballs, with the obvious competition to go with it. Some opt for modern takes on meatballs, like putting thyme and parmesan in them. Others go with revival recipes from the 19th century which include sweet anchovy brine. My favourites remain my mothers: she makes them small, juicy and hot with white pepper. One thing is clear: never make them all beef, and never, ever, replace the butter with olive oil. The Christmas ham (julskinka) is another central feature of the meat table, with different strong mustards (home-made, as seen in the background, makes for the strongest kind), cheeses and dark, sweet bread. One of Sweden’s most famous Christmas songs is about a julskinka that ran away. Julskinka is also the reason why you will be served so many home-made hawaii, capricciosa or other ham-based pizzas after New Years eve. No matter how much ham you eat, it just never ends. Adding to this equation, people tend to assume that the larger hams are tastier. Danish paté (dansk leverpastej) with Cumberland sauce and cornichons is a sandwich-linked must-have on the Southern table. With home-made cumberland sauce it’s one of my favourites, as the aroma of the orange peel is delicious together with the creaminess of the paté and the salty pickle. Janssons frestelse (The temptation of Jansson) is a creamy, potato based dish with onion, breadcrumbs and anchovies. Sometimes people sneak caviar into it for the perfect amount of saltiness. It’s eaten with the ham, meatballs or eel, or just about anything on the table. Beside the köttbullar and julskinka, Janssons is one of the most common things found on any Swedish Christmas table. No Janssons, no Christmas. Lutfiskpudding is a weird one. This dish, prepared with white dried fish, butter and rice, is loved by many of the older generation but sadly not quite understood by me. But apparently there’s something irresistible about the crusty surface and the lutfisk flavour eaten together with loads of butter. 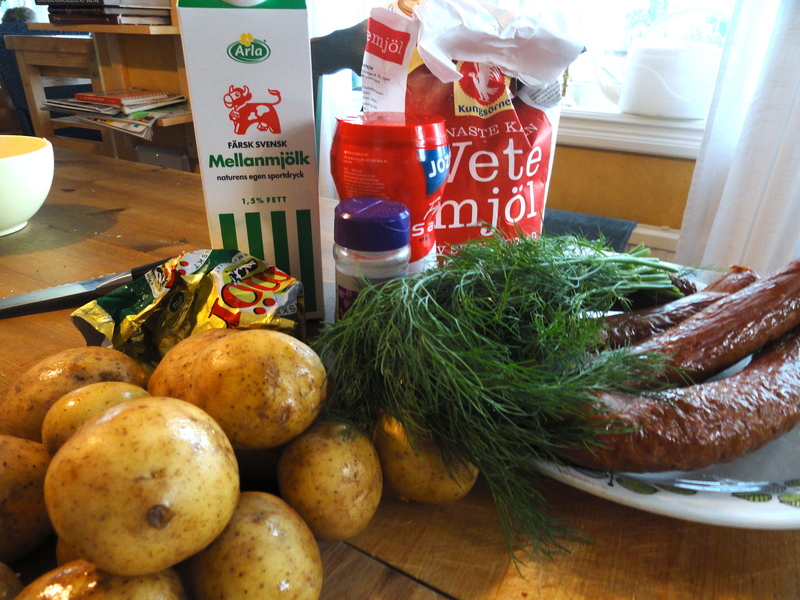 No julbord would be complete without sausages (julkorv). There are normally a few varieties of these, including reindeer, wild boar and normal smoked salami with green pepper. They are normally accompanied with four or five kinds of cheese as well. All the savoury food is served with beer and frozen snaps of course, which is taken every five minutes with a rowdy or happy Christmas song. If you’re confused regarding which snaps to go for, always opt for Linie aqvavit, which is a safe bet and enjoyed by most. Try Piraten or Beska droppar at your own peril. The dessert of the julbord is called risgryngröt and is a form of sweet porrige. In Sweden, it’s tradition to eat risgynsgröt with an almond smuggled into in. Whoever eats the almond is said to get married the following year. My aunt tends to cheat and add four or five, so that people have a bigger chance of getting married. 25 years and it still hasn’t worked. And for someone who’s not into desserts much, I have little love to spare for risgrynsgröt. It’s quite heavy, with lots of cream, and in the South it’s normally served with raspberry sauce (normally just wild raspberries, in the freezer since summer, and then gently simmered with some sugar on the stove). The anomaly on the picture is the Norwegian way of eating it, with butter and cinnamon (as preferred by my stepmum). Of course, this is far from a comprehensive overview of what Swedes eat at Christmas, as I’ve left out dopp i grytan, rödkål, brunkål, svampgaller, lutfisk and many other dishes. But since it’s Christmas and I’m feeling lazy, I leave you with this for now. God jul!